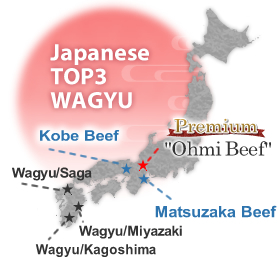 Definition OUMIBEEF"Japanese Three Major WAGYU"
The Japanese three major WAGYU are the MATSUZAKABEEF,KOBEBEEF, and OUMIBEEF. The one which is the oldest history among those and has beenbrought up in the rich nature and climatic natural features inShiga and built up by the effort of ancestors and the skill of thecraftsmen is the OUMIBEEF. It is the WAGYU of the high quality that stubbornly kept thetradition and is raised with plenty of love in Shiga Prefecture.